“Cellotronics.” Var. composers. Tanja Orning (cello), Christian Wallumrød (synthesizer). Albedo 024 (http://www.albedo.no/). Cello / synthesizer duet Orning and Wallumrød’s fine Albedo disc delivers vivid, arresting ea. Absent program notes force attentive listening. The pair’s brief improvisations take the odd-tracks. They know the measure of right-sized material, how to balance pitch and noise, and — most crucially — when to stop. Opening dreamily, Chelsea explores a folksy chorale with quavering, theramin-like tones. Under-two-minute Jilt aligns pizzicato with bright flute-like synthesizer attacks. Battutto flexes the rubbery stick-against-string sound but soon leads to a different place, possibly the result of tape manipulation. Bias Ply offers a slow-moving diaphanous texture. The longer pieces set Orning against other composers’ tape and electronics. Henrik Hellstenius provides a blustery Ricercare, the cellist’s melodic striving balanced by pitched washes. The ending brought to mind the conclusion of Lutoslawski’s Cello Concerto with its rapid scurrying and repeated tones. Eivind Buene’s Second Conversation with J.S. swims through ring modulation’s rich harmonic soup. Orning pushes an indifferent skittering line. Albedo’s disc comes with a mpg4 track for experiencing Øyvind Torvund’s Krull Quest with Risto Holopainen’s crude arcade graphics visuals. Through the bitter zing of distortion and analogue filtering, the cello plies a simple tune. The longest work is Natasha Barrett’s Symbiosis. Whereas the other pieces are clearly all cut from the same cloth (consistently busy or with clearly defined sections), the nearly eighteen-minute composition’s unpredictable contours defy easy grasp. It’s also the disc’s first track to incorporate musique concrète (a basic sampler of trains, sighing, rain, footsteps crunching on gravel), albeit infrequently. While the other tracks entertain, this one transforms. Orning and Wallumrød’s airy chorale Spectre Gul closes the collection, and it may be merely the track ordering, but they seem spent. 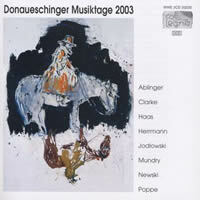 “Donaueschinger Musiktage 2003.” Pierre JODLOWSKI: People/Time (2003); Arnulf HERRMANN: Panorama (2003); Enno POPPE: Rad (2003); Sergej NEWSKI: Fluss (2003); Georg Friedrich HAAS: natures mortes (2003); Isabel MUNDRY: Penelopes Atem (2003); Peter ABLINGER: Altar – 3. Teil, “Drei Minuten für Orchester” (2003); James CLARKE: Final Dance (2002/03). col legno WWE 2CD 20230 (http://www.col-legno.de/). Distributed in the US by Qualiton (http://www.qualiton.com/). As ever, col legno makes everything sound perfect. CD 1 corrals this Donaueschinger yearbook’s youngsters: Jodlowski (b. 1971), Herrmann (b. 1968), Poppe (b. 1969), and Newski (b. 1972), all of whom employ electronics with inconsistent results. Poppe’s Rad for two continually retuning microtonal keyboards is the most listenable of the four. Departing from Nancarrow and Wyshnegradsky territory, we arrive at invigorating massed electronic clacking. Negotiating a tangle of wires is probably a prerequisite for young composers nowadays, but what’s the point if you’ve nothing to say? A lengthy 26:16, Jodlowski’s messy People/Time savages an unremarkable tape and instrument gallery: too much material spread too thin. Herrmann’s Panorama takes a text by Thomas Lehr which considers the last 11 seconds of a person’s life. Interesting conceptually, the music falls short. Of course we’re missing the video component, which may explain the unsatisfying audio experience. When will col legno start releasing DVDs? Newski’s Fluss charms because it’s merely 5:47. The gasping speaker and avant-gardisms probably wouldn’t have sustained any longer. CD 2 contains familiar names, including three orchestral works delivered by the SWR Sinfonieorchester Baden-Baden und Freiburg under Sylvain Cambreling. Haas’ natures mortes is a grand billboard akin to Ligeti or Xenakis. A smart, serial-like flow soon leads to momentous blocks of hammered notes, sustained chords and shifting textures minimally manipulated. Mundry’s intense Penelopes Atem, with mezzo-soprano Salome Kammer and Teodoro Anzellotti, accordion, is too brief. With her dramatic sense she puts her disc-one peers to shame. Ablinger’s Drei Minuten occupies four minutes and the notes don’t quite explain why. We hear street noise layered against spectral analyses as rendered by the orchestra. Klangforum Wien skillfully dispatches Clarke’s Final Dance, a gently apocalyptic wind-down. 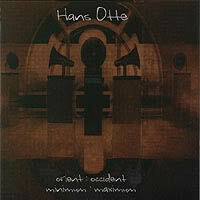 Hans OTTE: minimum : maximum (1973); orient : occident (1977). Karl-Erik Welin, Gerd Zacher (keyboards); Ingo Goritzki (oboe), Hans-Wilhelm Goetzke (clarinet). Pogus 21037-2 (issued from 1973 and 1986 Radio Bremen tapes) (http://www.pogus.com/). Otte’s bubbly minimum : maximum is a mid-70s artifact. These Radio Bremen tapes capturing the 1973 performance (a simultaneous concert in Stockholm and Bremen) are frisky and bright. Even though the keyboards’ treble patterns are overtly minimal, Cage and Tudor clearly swayed Otte’s thinking. The blippy organ / Moog synthesizer, the interspersed breathing noises, the French and German word collages, and even the oft-repeated “Ich” may grate. It’s evident that this composer didn’t have to impress anybody (unlike Jodlowski, Herrmann or Newski some 30 years later). orient : occident unrolls another minimalist carpet upon which oboe and clarinet spin luxuriant notes. Here too the spluttering synthesizer tape invokes Peter Max colors. Computer perkiness and human breath are perfectly balanced. How delightful that Pogus issued this disc. Is there more such waiting to be rescued? Man, those were the days! 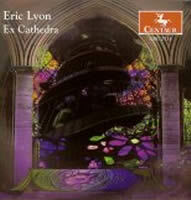 “Ex Cathedra.” Eric LYON: Sacred Amnesia (2001); Red Dwarfs from Outer Space (1999); Ex Cathedra (2002); Liberation #1 (2003); None of Us Will Ever Be the Same (2000); 1981 (1998). Centaur CRC 2711 (http://www.centaurrecords.com/). Distributed in the US by Qualiton (http://www.qualiton.com/). 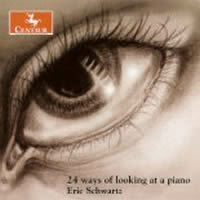 Eric SCHWARTZ: 24 ways of looking at a piano (2004). Centaur CRC 2754 (http://www.centaurrecords.com/). Distributed in the US by Qualiton (http://www.qualiton.com/). Ex Cathedra groups six clever, well-done pieces. Lyon is a deliberate assembler who doesn’t dwell on a point longer than necessary. Digital toys are in evidence, with allusions to the past and — probably — lots of inside jokes. I loved stumbling over the distorted “Mondestrunken” towards Sacred Amnesia’s end. Red Dwarfs from Outer Space oscillates with a genial goofiness. A gesture may be looped or subjected to gritty effects processing; a snip of movie dialog might take a cameo. Lyon shuffles through his stuffing quickly, happy to abandon one gem for another. Liberation #1 leans heavily on automated sound samples with well-reasoned results. None of Us Will Ever Be the Same increases the menace with transformed electric guitar samples. 1981 attempts a 22:17 assemblage, a long span for ea, but successfully done. Lyon adeptly varies spectrum range as well as rhythm for maximum variety. Quite possibly the spoken voice snips will sound dated in a short time (inevitable with political commentary), and yet, overall, Lyon’s collages demonstrate staying power. Working solely with recorded piano sounds and the self-imposed constraint of learning new gadgetry without resorting to the user manual, Schwartz’s first stab at ea, 24 ways of looking at a piano, duly impresses. The double-dozen pieces with whimsical titles (“the beelzebub rag,” “the organ grinder’s teeth,” “constable wiggum’s quaalude party,” “sunrise on the meat patrol,” etc.) reflect Schwartz’s carefree, experimental bent. Absurdly claiming Bach’s WTC as an influence, Schwartz favors distorted timbres such as you might hear in grunge or rock, but keeps to just one or two moods per track. He has more fun maximizing his material than more experienced colleagues, and his joy of capricious discovery will likely infect the listener. 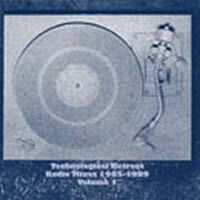 Greg CARR: “Technological Retreat: Radio Mixes 1985–1989, Volume 1.” Innova 210 (http://www.innova.mu/). Nineteen tracks — excerpts actually — swiped from Carr’s live on-air radio mixes originally broadcast over KFAI (Minneapolis). Carr occupied the 1:00–6:00 a.m. slot, Sunday night into Monday morning, with license to do as he pleased. His dense collages combine music, sound effects, spoken word and other TV / radio broadcasts. Sometimes the materials are played backwards or their speeds are manipulated. You could amuse yourself with the needle-drop game: I picked out Switched-On Bach, The Magnificent Seven’s main title, and some Reich. Back in my college radio days, I infrequently tried my hand at this sort of thing. It’s harder than it sounds — such collaging requires stamina and foresight — but provides a rush when it all aligns, even if it is ephemeral radio noise. Perhaps you know instinctively that Bach’s violin partitas go well over a Nairobi beat, or that Bruckner and Les Baxter can jive. Effortless gear-shifting is a requirement and Carr is a pro. 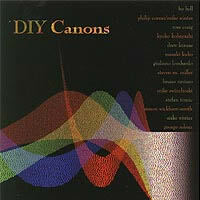 “DIY Canons.” Var. composers. Pogus 21036-2 (http://www.pogus.com/). There’s something for everyone in this two-disc set. Larry Polansky’s canonic work led to a “magic box” algorithm which he described and named “DIY Canon,” a four-voice mensuration canon where each line has the same melody but flows at a different speed so that all voices end together. Each melody may also permutate according to a set of rules. (Instructions and score are here.) Simon Wickham-Smith has collected several composers’ attempts at Polansky’s recipe. The success of these pieces comes down to the raw materials and their capacity to interest the listener. The ones derived from real, non-musical sounds best strike my fancy: Kyoko Kobayashi’s Cat Canon, Bruno Ruviaro’s Entrei Pelo Canon 1a with its screaming men, Stefan Tomic’s Ringtone Canon, Bo Bell’s Metrocard Canon, and Ross Craig’s thankfully brisk Barbie’s Phone Canon which draws its substance from a toy. Several canons trudge through pure computer sounds. Once the pattern’s repetition makes itself understood, I’m itchy to move on. The only exception is the longest offering, Wickham-Smith’s 11-minute Kullankeltaiset Päivät (Larry-lle), the abrasive filtering of which unhurriedly steamrolls.